Keeping your Piloroo availablity calendar updated is the best way to attract confident customers. But what if you need to block out a large number of sessions or dates? 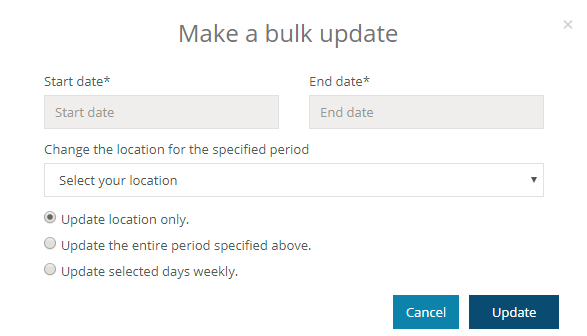 Using the bulk update tool, you can set your location or availablity for long periods (such as holidays or busy periods). You can also clear your entire calendar, except for those bookings you have already accepted. Selet Make a bulk update. Set the Start and End dates of the period you wish to update. Select the radio button “Update location only”. Choose whether you want to mark the period as busy or to clear all sessions. Select the type of sessions you wish to update. By default, all sessions are selected and updated.